Previously, prions were studied using lengthy bioassays where infected animals were studied over long periods of time (1–6 months). This was both time consuming and costly to maintain the infected animal. Researchers at Rocky Mountain Laboratories in Hamilton, Montana, have developed a new prion seeding assay called Real-Time Quaking Induced Conversion Assay (RT-QuIC) that gives end point quantitation for measuring the levels of prions in infected samples2. This assay is both faster and higher throughput compared to previous methods. The assay can be completed in as short as 20 hours and is as sensitive, if not more so, than whole animal models. German engineered for durability, BMG LABTECH’s Omega series of microplate readers have the ability to vigorously shake (700 rpm) and incubate microplates over long periods of time. A POLARstar Omega was used to measure RT-QuIC samples every 15 minutes for 20–68 hours while alternately shaking for a minute and resting for a minute. Combining parts of the original Quaking Induced Conversion (QuIC) assay3 and the amyloid seeding assay (ASA)4, the RT-QuIC assay is used to estimate the relative amount of prion seeding2. The assay measures serial dilutions of samples, statistically estimating the seeding dose (SD). In the assay, very small amounts of infectious prions are added to normal prion proteins. This seeding causes the misfolding of the normal prion protein, as seen in the disease. The fluorescent dye thioflavin T (ThT) is used as a prion seeding marker. This dye gets incorporated when prion polymerization occurs causing an increase in fluorescence over time. The assay is quantitated by measuring serial dilutions of the samples and determining the loss of seeding activity (SD50), which is the end point dilution. The Omega was set to incubate at 42°C for the entire 20–68 hour period. A script was created to use two test run protocols. One protocol was set to shake the plate for one minute and rest for one minute. The second protocol was set to take a fluorescence endpoint measurement using the bottom optic every 15 minutes. For a full description of the assay set up and proteins used see the full citation2. A Spearman-Kärber analysis, analogous to a bioassay’s lethal dose of 50% (LD50), was used to estimate a seeding dose or dilution at which 50% of the wells became ThT positive per gram of tissue (SD50/g). For Spearman-Kärber analysis a dilution series with at least one dilution giving 100% ThT positivity and at least one dilution giving 0% ThT positivity was chosen (see reference 2 for complete explanation of data analysis). 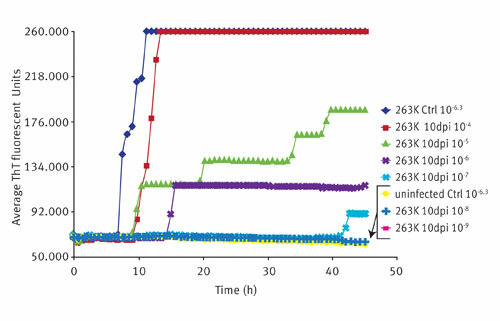 In the example in the Figure, the RT-QuIC assay was measured for 46 hours. Data was collected as an average of relative fluorescence units over 8 replicate wells. Only data for every 45 minutes is shown. The POLARstar Omega is able to shake in a unique double orbital pattern, which is ideal for this assay. For incubation, the temperature was maintained at 42°C over the entire measurement period. The high-quality design and manufacturing of the Omegas allow researchers to measure continuously for days at a time without a break in shaking or temperature fluctuations. Data was collected without interruption and outputted to BMG LABTECH’s data analysis software (MARS) and Excel. The Figure shows the RT-QuIC assay as it relates to hamster scrapie brain homogenates (BHs)2 that were harvested 10 days post inoculation. These RT-QuIC results correlated well with bioassay results2. This data shows that the RT-QuIC assay can be considered a faster higher throughput alternative to whole animal bioassays. This also shows that animals as early as ten days post inoculation can be examined using this assay. RT-QuIC assay measures prion seeding in days instead of months. Shown here is an end-point dilution of hamster brain homogenates taken 10 days after inoculation with prion protein (263K). The approximate 50% seeding dose (SD50) was achieved with a 2 µL aliquot (the seed volume) of a 10E-5 dilution (green line). This gave SD50/g of 10E8.2. Figure was adapted from reference 2. Prion seeding can be measured faster and in a higher throughput using the RT-QuIC assay and a microplate reader. Some of the transmissible spongiform encephalopathies that have been shown to work using RT-QuIC include hamster and sheep scrapie, deer chronic wasting disease, Creutzfeldt-Jakob Disease (CJD)2, and Bovine Spongiform Encephalopathy (BSE)3. This assay is both faster and more sensitive than past bioassays 5. The Omega series of plate readers from BMG LABTECH are both functional and robust to withstand the many days of shaking at high speeds required for this assay. 3. Atarashi R, et al. 2008. Simplified ultrasensitive prion detection by recombinant PrP conversion with shaking. Nat Methods 5: 211–212. 4. Colby DW, et al. 2007. Prion detection by an amyloid seeding assay. Proc Natl Acad Sci U S A 104: 20914–20919. 5. Atarashi, R. et al. 2011. Real-time Quaking Induced Conversion. Prion 5(3). PMC3226039.